Body — Elissandra & Co.
September 28, 2018 Elissandra & Co. Your pitts have a problem. Mine did too. A couple years ago I started going green and clean around my house with cleaners, starting with Seventh Generation and Method products and slowly moving on to Norwex products (I LOVE them, more on them in a later post). Eventually this cleansing of our home led to my bath, personal, and make up products. 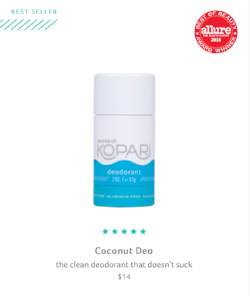 I have been searching what seems like forever for an all natural deodorant that is moderately priced, actually works, and available in a stick or roll on application. There are plenty of options out there for natural deodorant prices but I feel like all the good ones that actually work cost about $25-$30. I mean, C’MON!!! I can’t afford that. I’ve gone through several different brands in my pursuit for pure pitts and each one had their pros and cons. I *think” I have finally found one that I love and will keep using, thank god. See below for the different ones I’ve tried and which is my fav!! 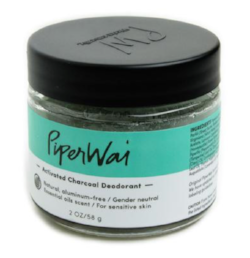 Initially I saw Piper Wai on Shark Tank and was really excited to try it. I bit the bullet and paid the $12 (it may have been higher since this was years ago) plus taxes and shipping. Also at this time they did not sell the convenient stick but only the jar. My first impression of the product was that it smelled good and was packaged nicely. When using the deodorant I did not like having to use my hand to apply it to the skin. Personally I already wash my hand s about 100 times a day so having to do so one more time just kind of annoyed me. I felt like the product would work for the first couple of hours but would stop past hour 4 or if I was doing something really intense. My job is quite physical, so I need something that will hold up to a lot of movement and sweat. I discovered Native by way of Instagram ads. I LOVED Native immediately since their deodorant actually works and automatically came in a stick. Also they have a much better price point than Piper Wai (for their stick application), although still expensive compared to mainstream brands. The deodorant went on smoothly and for the most part you did not get the white streaks if you rubbed the deodorant in by passing your arms back and forth (front to back). I love that Native has tons of scent options for every nose and seasonal scents as well. I ultimately stopped using Native because I started having an allergic reaction to the product. Upon noticing the reaction (a red bumpy sensitive rash on my under arms) I contacted a representative from Native to ask if they have had anyone else experience this. They were very helpful and knowledgeable and gave me some tips to try to help. I switched to their sensitive skin formula and it did not really help. I really wish my body would have liked their formula more since they have so many fun scent options. What’s nice about Schmidts is that it is super accessible because you can purchase it at Target as opposed to the ones I’ve mentioned previously. The sizes and scents available at Target are limited. You are paying around the same price as mainstream deodorant, possibly a little bit more. On Schmidts website they offer so many more scent options that sound divine. I didn’t have quite as bad of a reaction with Schmidts deodorant and was able to control it. I stopped using Schmidts because Target had it back ordered and I ran out. Additionally it wasn’t my favorite to keep seeking it out. I didn’t like that I got white marks on my clothes and that it didn’t feel like it fully absorbed. I have finally found the deodorant that pleases my picky pitts. I like it because it smells like rose petals and coconut oil. Kopari comes in a stick form and when you first put it on, it almost feels wet, but it soaks in fairly quickly, glides on smoothly, and I never have had white streaks as it dries. Even better, my pitts didn’t react to this deodorant!!! I never have stinky pitts at work as this lasts all through my 6-7 hour shifts. The only downside I can see is that it isn’t super accessible, as in you cannot buy it in store accept in one place that I’ve seen, Sephora. But with a subscription service this isn’t that big of a deal. The last thing that is super cool is that Kopari offers a rewards points program. You get points for purchases and other activities, think social media shares, reviews, etc., that you can redeem for free swag and product. So cool!